What would my life have been if I had a handbook telling me how to navigate life after university? I can't remember the last time I published a post with as many pictures as this one right here. Unfortunately, quite a number of them aren't super sharp but I'm going to share them regardless and tell you guys what this is all about. Have you heard about Graduate Pro? Most likely not. Heard about Naomi Lucas? Most likely not too unless you have been involved in the Youth Empowerment sectors and some other core niche industries. Such was my case when I was first told about the project. Unknown to a lot of people, I've always wanted to do some voluntary work. I was very specific about the sectors I wanted to volunteer in but never quite seemed to find a connection to them. When I heard about this, it was like someone was listening in my head and had come out to find me ..if that makes any sense, lol. I'm a Graduate Now, What? is a first of its kind project that deals directly with the issue of unemployment from the perspective of graduates and the challenges they grapple with in their search for gainful, meaningful work. The book is intended to be the definitive companion to graduates who have schooled and hope to work within Africa. The book will be narrated by 51 exemplary people at different stages in their lives and careers - innovators, entertainers, professionals, entrepreneurs, politicians, religious figures, govt. officials etc. What we ask is for you to be part of a pan-African movement of credible people lending their voices to a worthy cause. And that's what I read too. Of course I was excited and accepted the invitation to be a part of it. Here I am with Remi Olutimayin, the voice coach. This was the first hurdle I had to cross before the actual recording as the delivery of the narration had to be just right. Annnnnddd, I discovered I've a hidden voice acting talent. Can you imagine that? He was surprised I'd never done a Voice-over in my entire life. So I'm adding voice acting to my CV people, voice acting you hear me? Pictures are always taken after each session and apparently, they do silly pictures. It's bad enough that I'm too shy to take regular pictures it's now silly pictures se? You must be kidding, lol. Selfie time! Onye and KDL took all the shine out of the rest of us here. Remi Olutimayin - the voice coach who helped me discover one more talent I have. couldn't help myself. I really, really didn't know what pose to do. Onye asking why everyone apart him gets to take a picture with me. He's an awesome guy really. There are lots of pictures of both of us on my Instagram. The only reason why I decided to post this. Back to the Book project. I'm really honoured to be a part of this project and I can't wait for the book to come out. It'll be really great to have the whole world listen to my voice and maybe then, I'll tell you guys which of the chapters I narrated or perhaps let you guys guess. 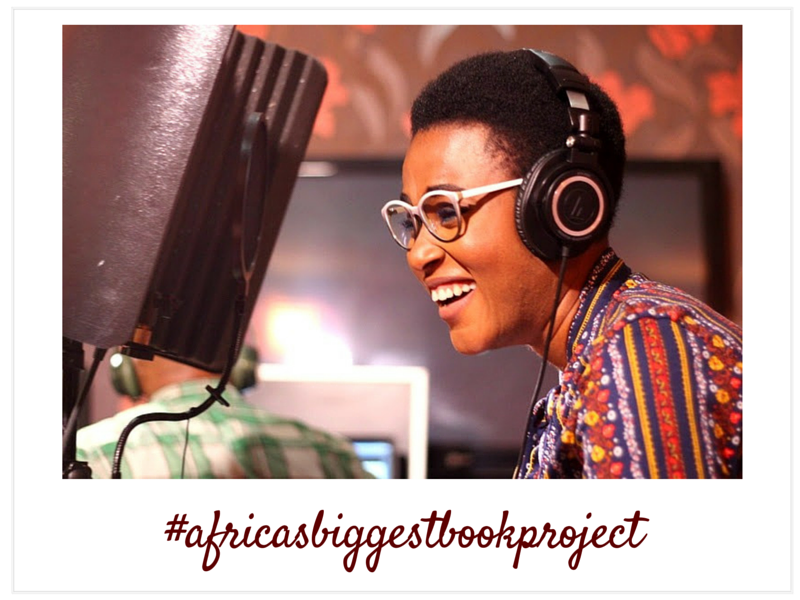 Some of my fellow narrators are Audu Maikori, OC Ukeje, Jodie, Chigul, Helen Paul, Aisha Augie-Kuta, Milfred Okwo, Wole Oguntokun, Moses Siliko Siasia, Lydia Idakula, Japhet Omojuwa, Jimi Tewe, Dayo Israel, Yemi Amusan and so many more. Have you heard about the Book project before? Are you looking forward to it as much as I am?